Gauge – Inner to inner distance between two rails. Ballast forms the Bed upon which railway sleepers or railroad ties are laid. It is packed between and around the Sleepers. It is used to bear the load from the Sleepers, to facilitate drainage of water, and also to keep down vegetation that might interfere with the track structure. This also serves to hold the track in place as the trains roll by. 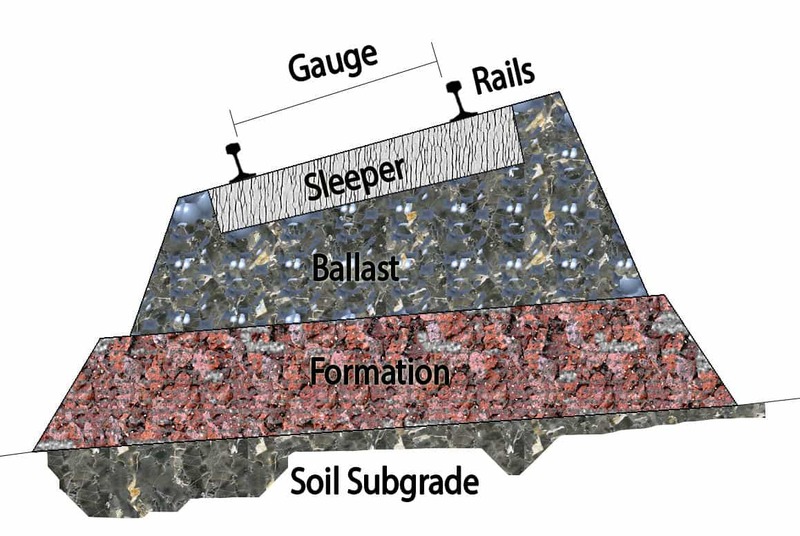 It is typically made of crushed stone, although ballast has sometimes consisted of other, less suitable materials. Formation consists of a certain number of rock strata that have a comparable or similar properties. Sleeper is a rectangular support for the rail tracks. It is laid perpendicular to the rails, sleepers transfer loads to the track ballast and subgrade. Sleepers hold the rails upright, and keep them spaced to the correct gauge.